Sardinian from Macomer, born in 1988, Simone Tondo was born two months premature and from that moment on, during his not-yet-3-decades of existence, he rushed into every other thing. 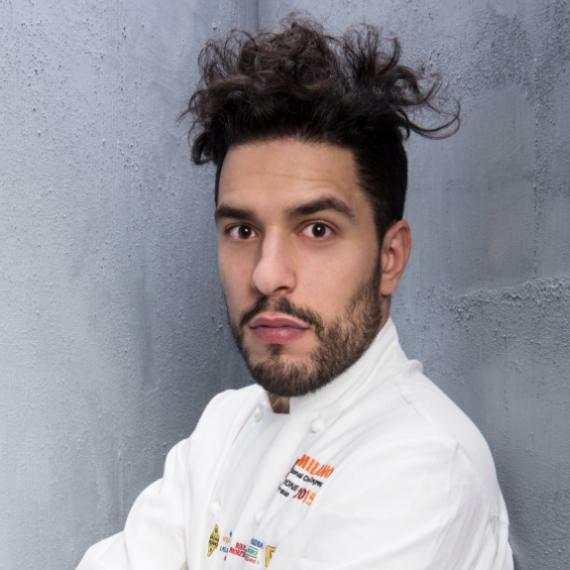 After finishing catering school in Alghero in 2008, he stayed there for 2 and a half more years, struck by the skill of Cristiano Andreini, a professional who cooks (today in Moscow) in an opposite way to Roberto Petza in Cagliari, Simone’s second great master. Cristiano&Roberto, that is to say North and South, technique against artisanal expertise, two beautiful and totally different ways of observing Sardinia on board of the avantgarde drone. Two short and very intense internships (Cracco2008 and Mirazurwith Mauro Colagreco in 2009) are the premise for the happiest choice made by this young man: going to Paris. In December 2009 he nourishes the myth of Rino (now closed)next to Roman Giovanni Passerini: sous-chef, chef and a flophouse with a minuscule kitchen and tables very close to each other. «This, however, is how I learnt what kind of food I wanted to prepare: next to people. For when you speak, you understand everything better». Meanwhile, Rino explodes and so does the community of young bistronomists in the Ville Lumière, many of whom are French, yet with a few Italians. Tondo quickly sneaks off from one experience to the other: Le Dauphinwith Inaki Aizpitarte, Saturne with Sven Chartier and most of all Petter Nilsson’s La Gazzetta, where he tests himself with bread and pastry making. But the Swedish chef is less and less present so Tondo asks his father (and the banks) for a little help to start a partnership with Michael Greenwold. On 2nd July 2012 they open Roseval in Ménilmontant, in the 20th arrondissement. The restaurant, seating 20 people and with a domestic-cool style, conquers a cult niche right away, in which the two guys soon start to throw prize after prize. Since September 2014 Tondo is the sole owner of the restaurant. Halfway between an Italian osteria and a gourmet restaurant, the chef is the host himself: he sings and brings the dishes to everyone. He cooks with intelligent raw materials, with pairings that are coloured with instinct and a unique verve: this is the menu, take it or leave it. Everyone’s happy to choose the first option in one of the most effective Italian restaurants at the moment. In January 2018 opens Racines and just a year later takes the Michelin star thanks to a 100% simple and Italian cuisine.